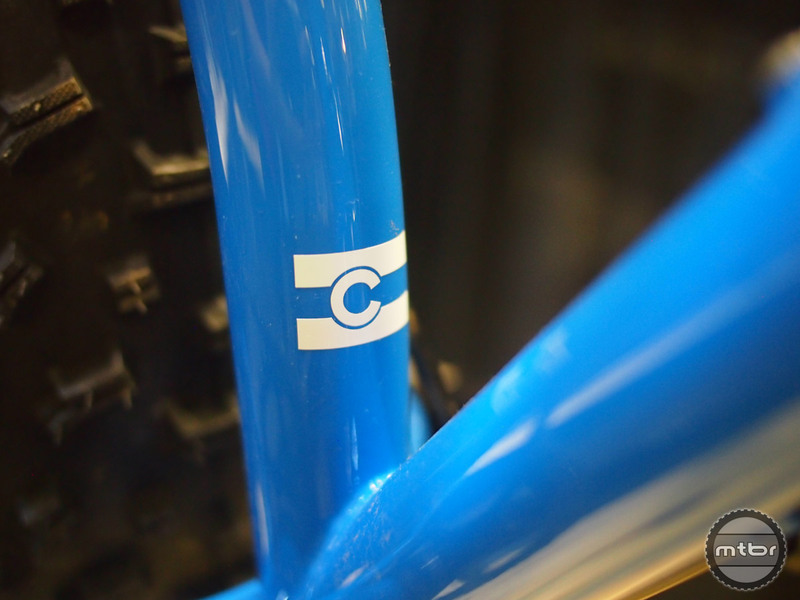 Collin Schaafsma is the owner, designer and welder of each Matter Cycles hand made bike. At a show like NAHBS (North American Handmade Bicycle Show) there is a tendency for road bikes to outnumber mountain bikes. 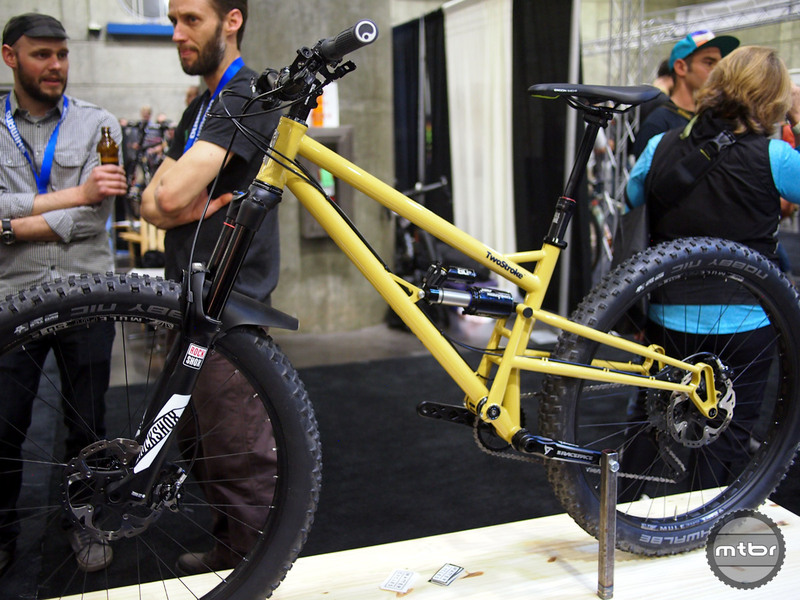 Among the mountain bikes, the hardtails outnumber the full suspension rigs by a large margin. There are many reasons for this, but chief among them is that road frames and hardtails are easier to build. Also, with so many manufacturers pouring money into R&D on the latest iteration of VPP, dw-link, concentric pivot or four bar linkage, it is a tough arena to dabble in. Matter Cycles is one such small builder, basically being a one man shop with Collin Schaafsma the owner, designer and welder of each bike. Based out of Boulder, Colorado, Collin decided to use a simple single pivot suspension design for its simplicity and the fun, playful way it rides. Featured here is a model he calls the TwoStroke, a 150mm travel bike made from True Temper butted steel tubing that is TIG welded. Key to the bikes layout are the rear dropouts that Collin designed. The CNC’d dropouts allowed him to pull off the geometry he wanted (a short rear end that could fit fattie tires and provide long travel). 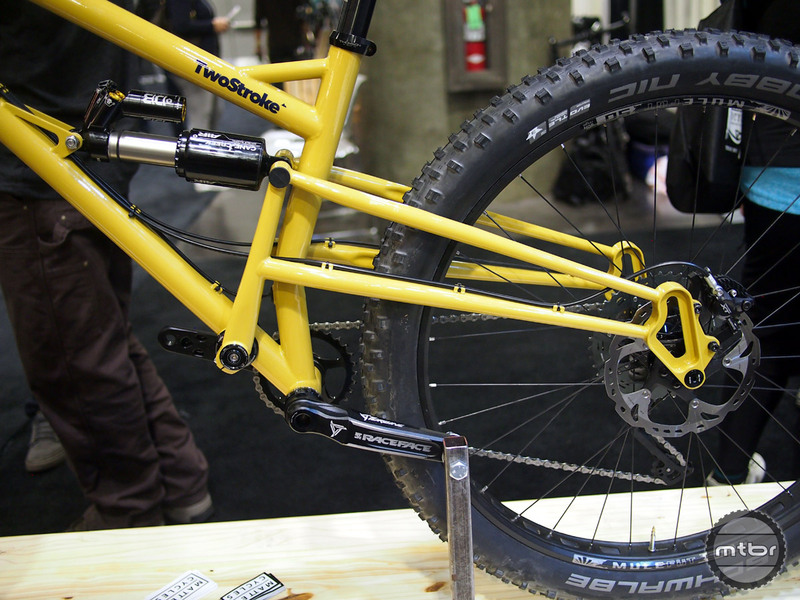 The elevated chainstays help keep things quiet and less prone to jammed chains. The s-bend stays are hand formed and the rear spacing is BOOST 148×12 so 27.5×3″ or 29×2.4″ tires fit, no problem. The main pivot location is high and forward, which is where computer analysis and test rides showed it should be in order to maintain a bike that could still climb well. The Cane Creek DB Air CS is tuned specifically for the TwoStroke. 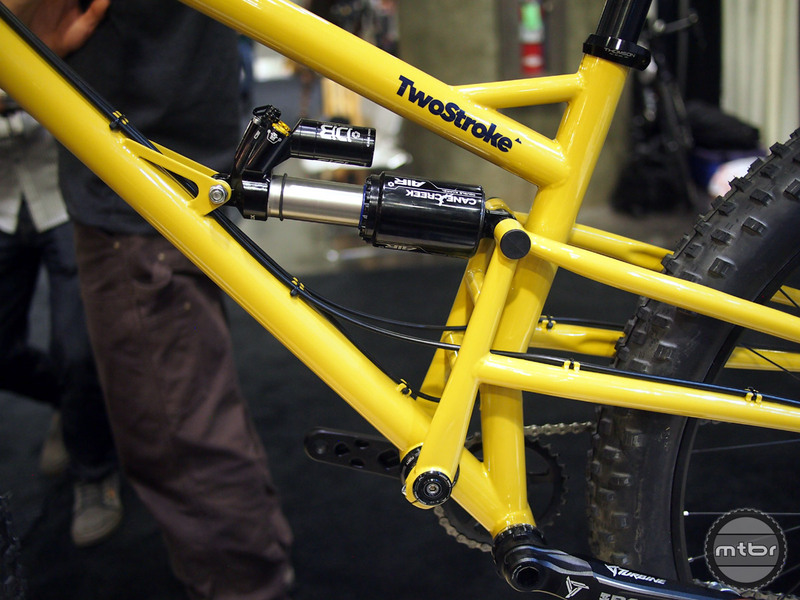 The TwoStroke also has five year angular contact bearings for the main pivot, 73mm English thread bottom bracket, stainless steel head badge, 44mm ID head tube for 1.5 tapered fork steerer, 31.6″ seat post size for dropper post compatibility and an exit port of internal routing of the dropper. The finish is two color powder coat with a layer of clear. The bike is designed to work with a 160mm fork and the geometry with this setup is slack with a 65.5 degree head angle. Pair that with the short 16.93″ chainstays and the handling is nimble and ready to get rowdy. The bike will be custom sized for each rider (stack and reach) and the price for frame and ride-tuned Cane Creek DB Air CS shock is $2850. This includes a Matter Cycles lifetime craftsmanship warranty. 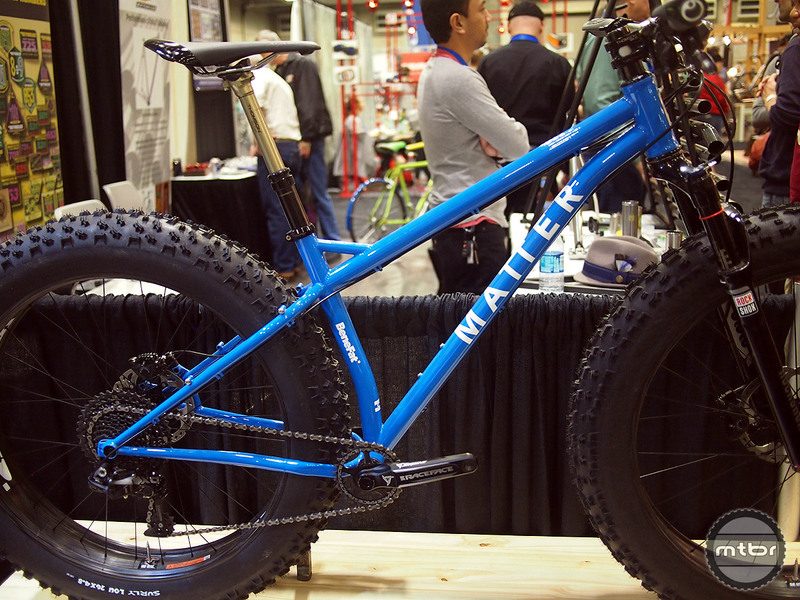 The side view shows the slack geometry of this rally style fattie. Collin was also showing his Benefat, a steel fat bike made for riders who perhaps already have a fat bike, but are looking for something with a more trail bike oriented geometry and handling. 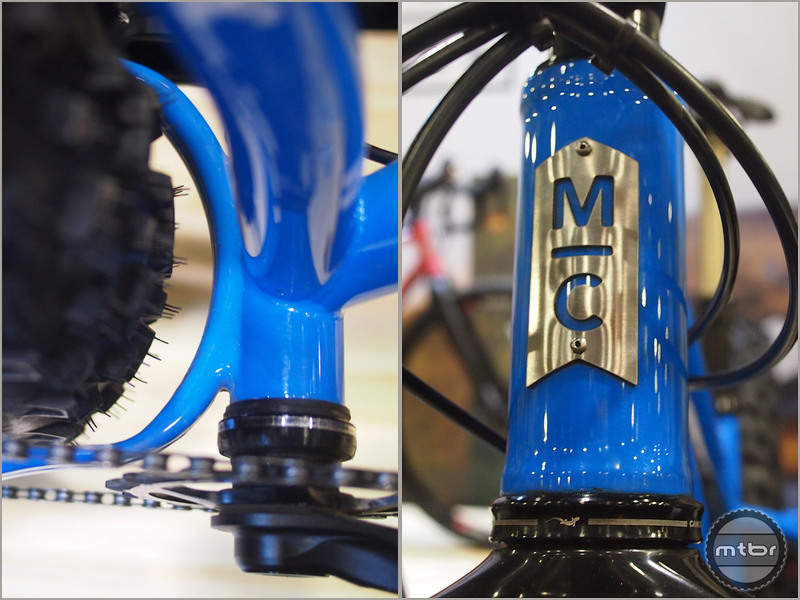 A close-up of the Benefat CNC’d yoke with tire clearance and machined head badge. In Collin’s words, it’s a, “fat bike that’s ready to rip.” The Benefat has 420mm chainstays, slack-ish geometry and tons of standover clearance. The custom two-piece CNC’d yoke provides the tire clearance required. 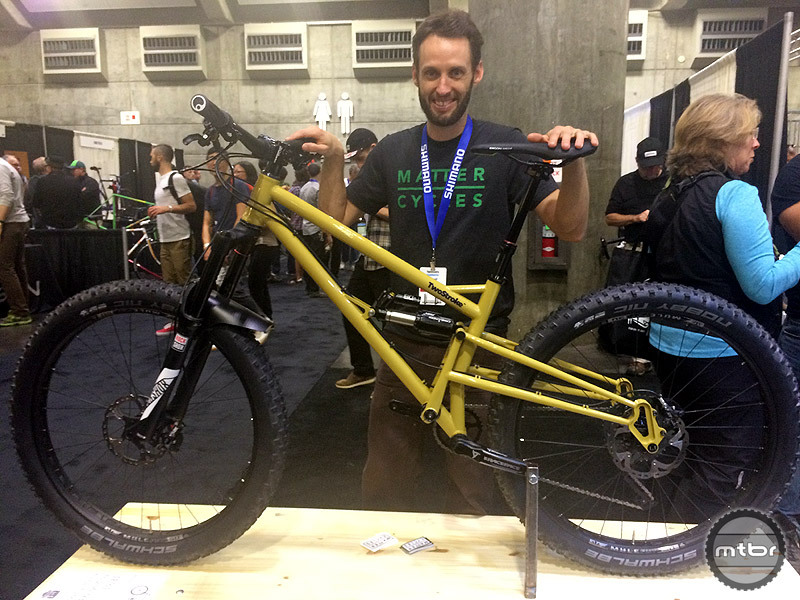 Collin has been building for four years and the Benefat is one of his more popular models. 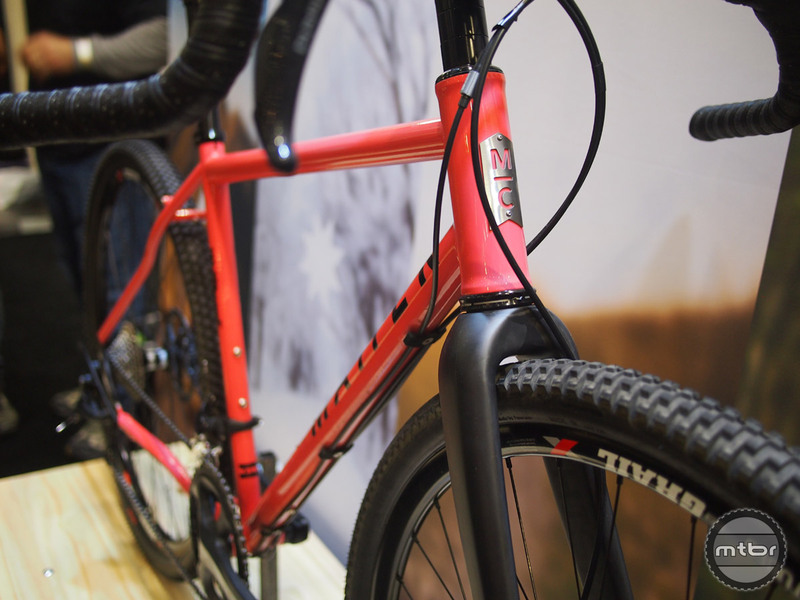 Matter Cycles make a total of 7 different bikes including this gravel grinder/adventure road bike. 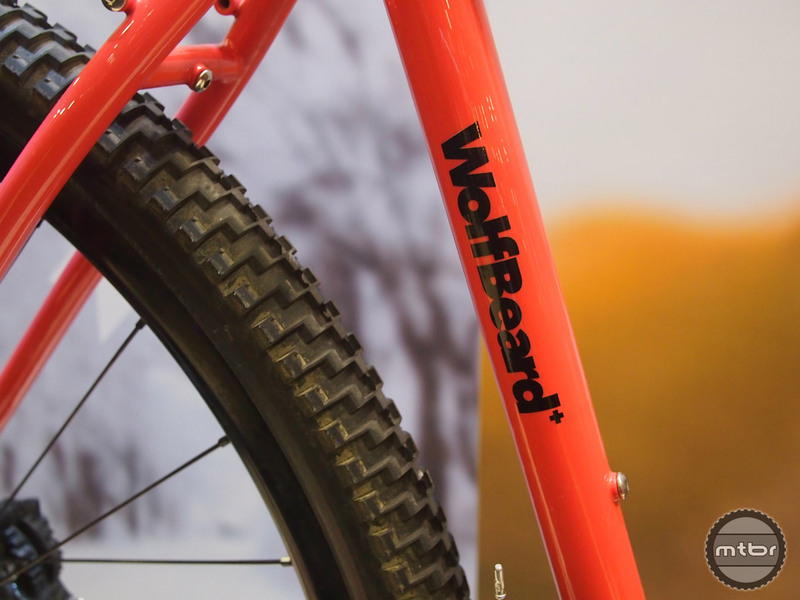 The Matter Cycles WolfBeard was also on display, a gravel grinder/adventure road bike. 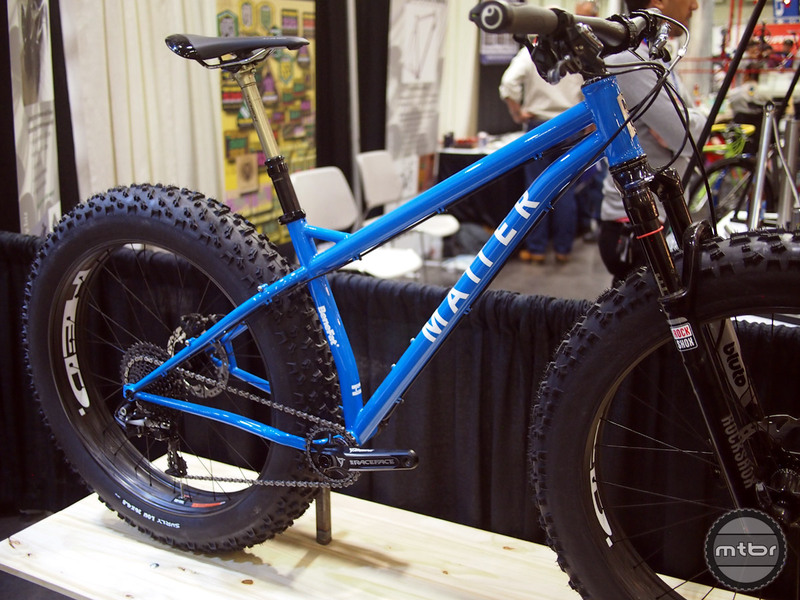 This bike features a shorter stem and long wheelbase but can run 44s easy with fenders. “Low and fun” according to Collin. For more information visit mattercycles.com. The single pivot design is simple, but effective. The names of each Matter Cycle bike is simple and fun.